At almost 90 years old, Edward O. Wilson is our greatest living biologist. Ever passionate about exploring our origins on earth, he is back with GENESIS, an eloquent, enlightening survey of social behavior that traces humanity’s advanced capacity for language, empathy, and cooperation back to its single-celled bacterial roots. Asserting that religious creeds and philosophical questions can be reduced to purely genetic and evolutionary components, and that the human body and mind have a physical base obedient to the laws of physics and chemistry, Wilson argues that the only way for us to fully understand human behavior is to appreciate the long, complicated evolutionary histories of nonhuman species. Of these, Wilson demonstrates that at least seventeen—among them the naked African mole rat and sponge-dwelling shrimp—have developed advanced societies based on similar levels of altruism and cooperation found among humans. A key component of that is Wilson’s own groundbreaking work in the areas of eusociality (where species evolve along hierarchical, role-specific lines) and group selection, that help explain why societies innately survive and thrive not just by means of war-like or aggressive behavior, but also via its nurturers and team builders. 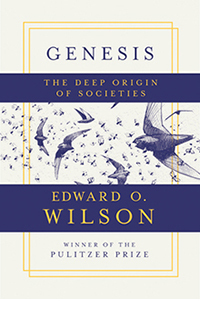 Just as Darwin, in his 1871 Descent of Man, proposed humanity’s origins through the study of apes and human behavior, Wilson here synthesizes the most updated research in evolutionary science to offer a pithy yet pathbreaking work of evolutionary theory. In GENESIS, he eloquently braids twenty-first-century scientific research with the lyrical biological and humanistic observations for which he is known and admired. Edward O. Wilson is widely recognized as one of the world’s preeminent biologists and naturalists. The author of more than thirty books, including The Social Conquest of Earth, The Meaning of Human Existence, and Letters to a Young Scientist, Wilson is a professor emeritus at Harvard University. The winner of two Pulitzer Prizes, he lives with his wife, Irene Wilson, in Lexington, Massachusetts. “In his characteristically clear, succinct and elegant prose, one of our grand masters of synthesis, E. O. Wilson, here explains no less than the origin of human society.”—Richard Rhodes, winner of the Pulitzer Prize and author of The Making of the Atomic Bomb. “Genesis is a beautifully clear account of a question that has lain unsolved at the core of biology ever since Darwin: how can natural selection produce individuals so altruistic that, rather than breeding themselves, they help others to do so? In elegant, simple language Edward O. Wilson distills a magisterial knowledge of animal diversity into an unambiguous argument that the solution is group selection. Rich in accounts of extraordinary societies, Genesis is the ideal introduction to a problem of enduring fascination.”—Richard Wrangham, author of The Goodness Paradox: The Strange Relationship Between Virtue and Violence in Human Evolution. Nature. “Evolving Society: Why Humanity Coheres.” By Agustín Fuentes. March 19, 2019. Kirkus Reviews [starred review]. “Genesis: The Deep Origin of Societies.” November 26, 2018. Publishers Weekly. “Genesis: The Deep Origin of Societies.” November 12, 2018.